South Georgia and the South Sandwich Islands (SGSSI) is a British overseas territory in the southern Atlantic Ocean. 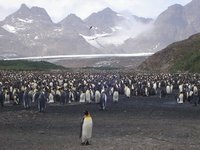 It is a remote and inhospitable collection of islands, consisting of South Georgia and a chain of smaller islands known as the South Sandwich Islands. The United Kingdom claimed sovereignty over South Georgia in 1775 and the South Sandwich Islands in 1908. The territory of "South Georgia and the South Sandwich Islands" was formed in 1985; previously it had been governed as part of the Falkland Islands Dependencies. Argentina claimed South Georgia in 1927 and claimed the South Sandwich Islands in 1938. South Georgia is 167.4 kilometres long and 1.4 to 37 kilometres wide and is by far the largest island in the territory. The South Sandwich Islands lie about 520 kilometres southeast of South Georgia. The total land area of the territory is 3,903 square kilometres). Most of the islands, rising steeply from the sea, are rugged and mountainous. At higher elevations, the islands are permanently covered with ice and snow. There is no native population on the islands; the present inhabitants are the British Government Officer, Deputy Postmaster, scientists, and support staff from the British Antarctic Survey who maintain scientific bases at Bird Island and at the capital, King Edward Point, as well as museum staff at nearby Grytviken. The climate is classified as polar, and the weather is highly variable and harsh. Typical daily maximum temperatures in South Georgia at sea level are around 0 °C in winter (August) and 8 °C in summer (January). Winter minimum temperatures are typically about -5 °C and rarely dip below -10 °C. Annual precipitation in South Georgia is about 1,500 mm, much of which falls as sleet or snow, which is possible in any month. Inland, the snow line in summer is at an altitude of about 300 metres. 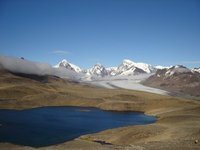 The highest recorded temperature was 28.8 °C at Grytviken and 26.3 °C at nearby King Edward point, both on the sheltered east side of the islands. Conversely, the highest recorded temperature at Bird Island on the windward Western side is a mere 14.5 °C. 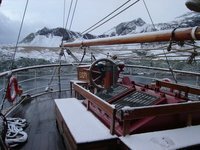 The sheltered eastern side can also record lower winter temperatures, the absolute minimum for Grytviken being -19.4 °C, King Edward Point -18.9 °C, but Bird Island just -11.4 °C. The South Sandwich Islands are much colder than South Georgia, being farther south and more exposed to cold outbreaks from the Antarctic continent. They are also surrounded by sea ice from the middle of May to late November (even longer at their southern end). Recorded temperature extremes at South Thule Island have ranged from -29.8 °C to 17.7 °C. The pound sterling is the official currency of the islands, and the same notes and coins are used as in the United Kingdom. As there are no native inhabitants, economic activity in South Georgia and the South Sandwich Islands is limited. The territory has revenues of £4.5 million, 80% of which is derived from fishing licences. Other sources of revenue are the sale of postage stamps and coins, tourism and customs and harbour dues. This is version 3. Last edited at 10:20 on Aug 21, 14 by Utrecht. 5 articles link to this page.